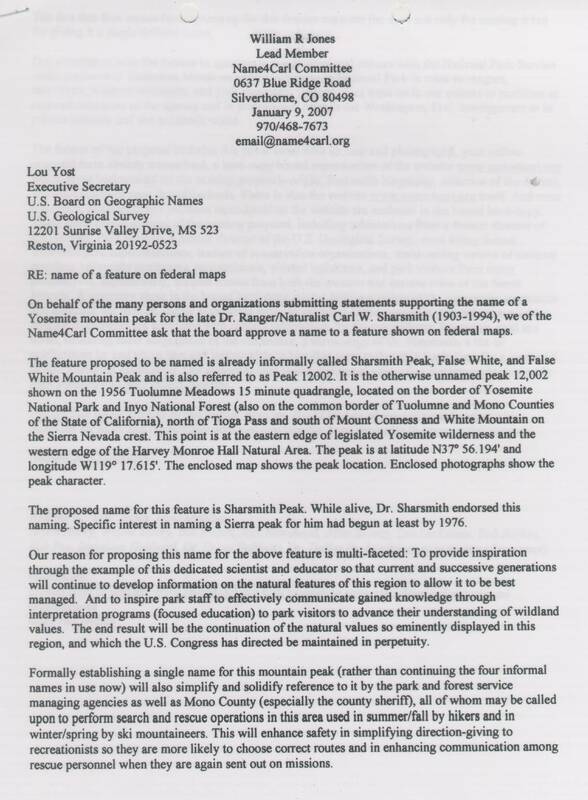 Thank you for informing us of receipt of our proposal to formally name Sharsmith Peak. Regarding your question of endorsement by the current superintendent’s office of Yosemite National Park, we are not aware that the office has taken a position on the matter of this naming The office has been informed of the proposal and is being sent a duplicate of the package of information with copies of endorsements that we have forwarded to your board, and which you should receive shortly. The fact that four of the living former park superintendents have written endorsements (Morehead, Griffin, Mihalik, Binnewies) makes us hopeful that the present administration will continue in support. Binnewies was also active in his support while superintendent as was Arnberger (now deceased), based on preserved written communications. Morehead is a member of the Name4Carl Committee. Too, two former regional National Park Service directors and one former director are in favor, as well as a former, now deceased, director of the U.S. Geological Survey. We have noted a posting on your website of this same proposal attributed to Mr. George Durkee of Sierra Nature Notes and have also been informed by others that they have written statements of support which they have sent directly to your Board. Our Committee has in the past advised your Board of these other expressions and now suggest that they be kept in a common file with our proposal or in files that are cross-referenced. This will acknowledge receipt of your proposal to name a feature in California, Sharsmith Peak. We shall begin processing the proposal, which will require approximately eight months to process. As you are no doubt aware, the most important policy is local use and acceptance, so we shall seek the recommendations of the county governments as well as that of the California State Names Authority, the land management agencies, and any other interested parties. You seem to be aware of the Board's Wilderness Area Policy, and have addressed that policy's requirements. We shall also be awaiting the documents of endorsement mentioned. You indicate that the office of the park superintendent has "in the past" supported the proposal. Does this mean that the office does not now do so? Actually, it is not really relevant because a park superintendent or forest superintendent cannot (by internal agency requirements) commit to support or lack of support on names issues without first consulting with that agencies member to the U. S. Board on Geographic Names (copied on this response) except, of course, as a private citizen. We shall keep you informed of the progress, and let you know the decision of the Board. Please let us know if you have questions. a means to understanding and effective correct action. occurred on the mountain's flanks. national park and forest managing agencies themselves. Peak 12,002, False White Mountain Peak, False White. National Park has in the past supported the proposal. being transmitted physically to the board at this time. forwarded their own letters of support. they have forwarded their own letters of support. Case Summary: This proposal is to make official the name Sharsmith Peak for a 3,658 m (12,002 ft) high summit in the Sierra Nevada, just northwest of Tioga Pass and 19 km (12 mi) west of Mono Lake. The summit also lies along the boundary between Yosemite National Park and Inyo National Forest, and on the boundary between Tuolumne County and Mono County. The National Park side of the peak is designated as the Yosemite Wilderness, while the National Forest portion is within the Harvey Monroe Hall Natural Research Area. The proponent, a ranger at Sequoia-Kings Canyon National Parks and editor of Sierra Nature Notes, “an online journal of natural history news in the Sierra Nevada,” reports that the proposed name has come into local use over the past few years. The name would honor Dr. Carl W. Sharsmith (1903-1994), who was a Yosemite National Park ranger-naturalist and alpine botanist, and at the time of his death, the oldest and longest serving National Park Service interpretive ranger. Dr. Sharsmith was featured in many books, magazine articles, and film documentaries about Yosemite. In addition, he created a 15,000-sheet herbarium at San Jose State University where he had taught and was Professor Emeritus; this collection, consisting largely of California native plants, is named the Carl W. Sharsmith Herbarium. In 1956, the Department of the Interior bestowed its Meritorious Service Award on Dr. Sharsmith. The proponent reports that the proposed name has come into recent local use, particularly among local hiking guides; the name also appeared in the Yosemite Association’s Outdoor Adventures brochure published in 2002. One hiking website refers to the summit as “Carl Sharsmith Peak.” The proponent has developed a website dedicated to this naming effort (http://www.name4carl.org/), at which he outlines his reasons why the name warrants an exception to the Wilderness Naming Policy. He suggests the name provides a means for educating Park visitors about the honoree’s significance to the area, and also that the proposal “will serve to continue inspiration of sound research and accordingly-designed management programs that will help ensure the natural character of the region.” He also provides an extensive list of individuals and offices that support this proposal, including the late Dr. Dallas Peck, former director of the U.S. Geological Survey; Dr. N. King Huber, USGS Geologist Emeritus; Roger O. Kennedy, former National Park Service Director (1993-1997); several former Yosemite National Park Superintendents, naturalists, and Park rangers; the Yosemite Museum Curator; the Yosemite Association; Elizabeth Stone O’Neil, the author of Dr. Sharsmith’s biography; and a former Board member of the Eastern Sierra Interpretive Association. This "Proposal Form" page last modified 05/29/2007 \name4carl\n4cprop.htm.